The earliest moments in the history of Portland are commemorated in the name of Lovejoy, given to the former L street when the city was joined with East Portland in 1891, for Amos Lawrence Lovejoy owned half interest in the land claim which later became the site of Portland. He was born in Groton, Mass., on March 14, 1808, and studied law at Cambridge and Amherst, later being the first lawyer in the colony which settled near Oregon City. His name appears in the list which made up the first wagon train to come across the plains to Oregon in 1842. There is some doubt as to the date when he first set foot on the ground which is now Portland, there being two distinct accounts of the same events, one taking place in 1843 and the other in 1844. At any rate, he met William Overton in Vancouver and together they were returning by Canoe to Oregon City when Mr. Overton suggested they go ashore, as he wanted to show Mr. Lovejoy a claim he had staked out, but had no funds to register and start clearing. The apparent depth of the water along the shore of the river and signs where ships had stopped caused Mr. Lovejoy to become interested in Mr. Overton’s claim and proposition that Mr. Lovejoy become a pattern in the claim in order to develop it. A cabin was subsequently built and the clearing begun, but Mr. Overton became discontented and left, selling his share to F.W. Pettygrove. Mr. Lovejoy and Mr. Pettygrove are the two men who later flipped a coin to determine whether the new village should be named Portland or Boston. Mr. Lovejoy in his time served as a member of the provisional legislature in 1844, attorney-general of the provisional government in 1844, mayor of Oregon City in 1845, chief justice of the provisional government in 1848, adjutant-general during the Cayuse war, and was also a member of the first territorial legislature in 1849 and several terms thereafter. He was a member of the constitutional convention in 1857, special United States postal agent in 1859, receiver of public moneys in the land office at Oregon City in 1860, and a union solider during the civil war. He died on September 11, 1882. Original Owner of Portland Townsite. Portland, Oct 18 – (To the Editor. 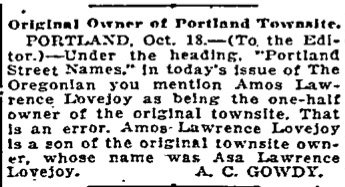 )- Under the heading, “Portland Street Names,” in today’s issue of the Oregonian you mention Amos Lawrence Lovejoy as being the one-half owner of the original townsite. That is an error. Amos-Lawrence Lovejoy is the a son of the original townsite owner, whose name was Asa Lawrence Lovejoy.